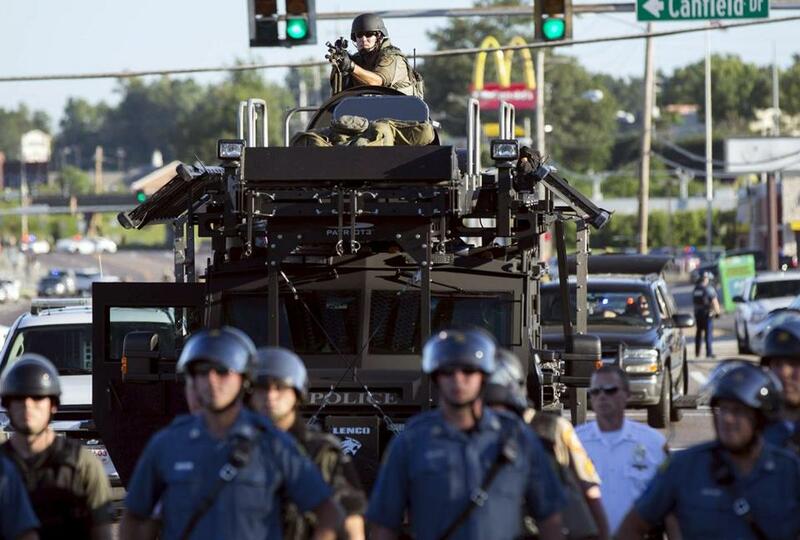 Riot police were deployed with a former military vehicle during protests in Ferguson, Mo., on Aug. 13, 2014. Images of police in armored vehicles patrolling the streets of Ferguson, Mo., last summer like soldiers in a war zone contributed to President Obama’s executive order this week to curb the flow of military-grade gear to local law enforcement. So it would be natural to assume the Massachusetts company that manufactured some of those $350,000 bulletproof trucks is worried about losing business. The president’s decision to curtail federal funding for what he called “equipment made for the battlefield” won’t apply to certain vehicles made by Lenco Armored Vehicles in Pittsfield, whose eight-ton BearCats are used by all four military branches and rank among the most popular police SWAT trucks in the country. “We don’t see the restrictions adversely affecting police acquiring BearCats,” said Lenco’s president, Len Light. The ban explicitly states that it only covers vehicles like tanks that “utilize a tracked system instead of wheels for forward motion,” and the BearCat operates on wheels, not a track. Law enforcement specialists say that armored vehicles like the ones made by Lenco vastly outnumber those with tracked systems, which are difficult to maneuver in urban settings and can damage roads. The exclusion of BearCats and similar wheeled vehicles from the new White House list of prohibited equipment could allow law enforcement agencies to continue buying them on Uncle Sam’s dime — and using them on the scenes of protests like those in Ferguson, where Lenco trucks rolled through town with snipers on the roof, and more recently in Baltimore. A White House spokesman declined to comment and referred questions to the Department of Justice, which pointed to new reporting requirements laid out by the president’s task force as examples of change. Police using federal funds to purchase BearCats and other tactical gear must report back to the government on their usage. The BearCat is essentially a mobile fortress, which the military uses to patrol areas where soldiers might encounter enemy gunfire or a roadside bomb. Built on a blast-resistant, V-shaped hull, its walls and windows can repel fire from .50-caliber guns — which, incidently, are on the prohibited equipment list, along with grenade launchers and weaponized aircraft. It does not have any built-in weapons but does feature a 360-degree rotating roof hatch from which a passenger can shoot. It can be outfitted with a battering ram and a hydraulic arm. Police say they like the BearCat because it combines the nimbleness of a SWAT van with the protection of a tank. With a top speed of 90 miles per hour, it can chase down bad guys and keep police safer than they would be in their cruisers. State Police rode in a BearCat when they approached the boat where Boston Marathon bomber Dzhokhar Tsarnaev hid at the end of an extensive manhunt in 2013 and used an arm attachment to remove a tarp that helped conceal him. Cases like that one reinforce many law enforcement officials’ belief that military-style equipment — though it may look scary and seem unnecessary for everyday police work — is sometimes the key to public safety. Chuck Canterbury, national president of the Fraternal Order of Police, said in a statement that efforts to restrict law enforcement access to military-grade gear are misplaced. The voices of people who disagree have grown louder in recent months, following several police shootings of unarmed black men. Public debate has encompassed law enforcement tactics in general, but equipment has become one flashpoint because of the heavy armament used in response to demonstrations in some cities. Even the justification requirement does not concern Light, the Lenco executive. His firm is adept at helping police write federal grant proposals, and BearCats are already on approved equipment lists for nine Department of Homeland Security grant programs, where much of the funding for such tactical gear originates. That would be good news for Lenco, which started in the armored bank truck business in 1981. It was founded by Light’s parents, but he bought them out in 1992 and steered the company into heavy duty tactical units. Early clients were mostly foreign militaries, but Light sensed an opportunity in the law enforcement market. Lenco introduced its first SWAT truck, a larger version of the BearCat called the BEAR (Ballistic Engineered Armored Response) in 1999 — just a few months before the school shooting in Columbine, Colo. Sales picked up after the attacks of Sept. 11, 2001, when new federal grants made it easier for local police to obtain advanced equipment without breaking municipal budgets.